The LFA mindset and methodology involve a purposeful change of focus from listing the biota/ species present or absent at a site, to an examination of the degree to which biophysical processes deal with vital resources with respect to stresses arising from management and climatic events. Fig. 1. Before: bare, crusted, low OC soil, erosion, and high water runoff mainitained by low but persistent, set-stock grazing by sheep and kangaroos. Fig. 2. The restoration treatment was simply to build brush-packs across the contour to trap water, soil and plant litter, slowing overland outflow. This also prevented the grazing down to ~1cm. Grass plants were able to maintain about 10cm of photosynthetic tissue. Fig 3. After 7 years. Clearly the soil properties have improved the ‘habitat quality’ for the target vegetation. Figure 4. After 14 years, native vegetation re-established. Fig 5. Detail of the brushpack after 3 years showing micro-structures capable of slowing water and accumulating resources. Where resources are not captured or leak out of a system, patchiness will become evident as resources self-organise around foci of accumulation – creating ‘patches’ where resources accumulate and ‘interpatches’ from which they ‘leak’. There is also no evidence of sediment transport (not visible in this image). This is because of the tortuous path and short inter-grass distance. It would be possible to derive the critical grass plant spacing for “sward” function in any landscape, taking into account slope, aspect and soil texture. 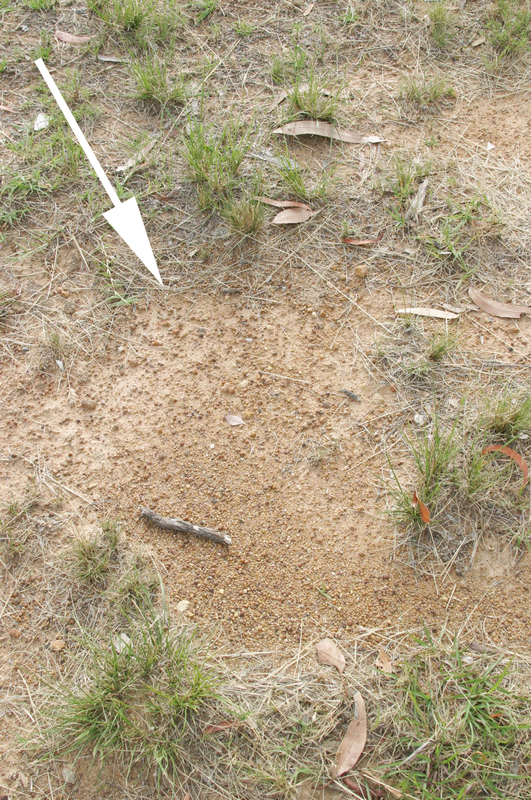 Note that litter and sediment have both been washed off the inter-patch and have been arrested by a down-slope grass patch. Note the orientation of the grassy litter strands. This entry was posted in Assisted regeneration, Erosion issues & solutions, Grassland/grassy understorey, Integrating ecosystems & industries, Monitoring, Restoration & management theory, Sclerophyll communities, semi-arid, Standards, Techniques & methodology. Bookmark the permalink.